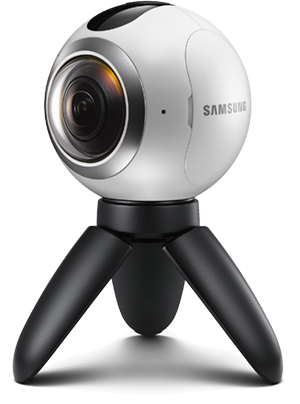 Samsung's Gear 360 is the 360-degree camera we've all been waiting for. It stands out. It has the power of one of the world's biggest tech companies behind it... and it's a somewhat frustrating product. The software experience is the best we've used in this class of camera, bar none. The industrial design is excellent. But the Gear 360 is greatly hampered by its inability to fit in a pocket, by being (currently) locked to Samsung's own phones, and by inconsistent stitching in processed photos. Our Gear 360 is on firmware C200GLU0APE4 (after an update), and we've used it with a Verizon Galaxy S7, with v1.04 of the Gear 360 Manager app. Which devices work with the Gear 360? These 360-degree cameras are a big deal. We're in the first generation still, but consider the following: With the touch of a button (more or less) you can now share the entire world around you, and not just what's in front of the camera. What's behind it. What's above it. And, to a lesser extent, even below it. There was no way Samsung wasn't going to get in this game. And Samsung plays to win. Always. So it was no surprise to see it unveil the Gear 360 spherical camera at Mobile World Congress, way back in February. (Alongside no less than the Galaxy S7 We've had to wait a while since then, and other 360 cameras have launched in the meantime. Does it matter how well-built this camera is if it's a pain to carry around? At any given moment it's entirely likely that the Gear 360 will spring to life, start crawling around my desk — and finally kill me in my sleep. There absolutely is something very alien about the way this thing looks. There's no way that's not intentional, of course. (Nor is it bad. It's just ... different.) Some of that is the three plastic legs when they're unfolded. And it's very much because the spherical body of the Gear 360 looks like something straight out of Portal. 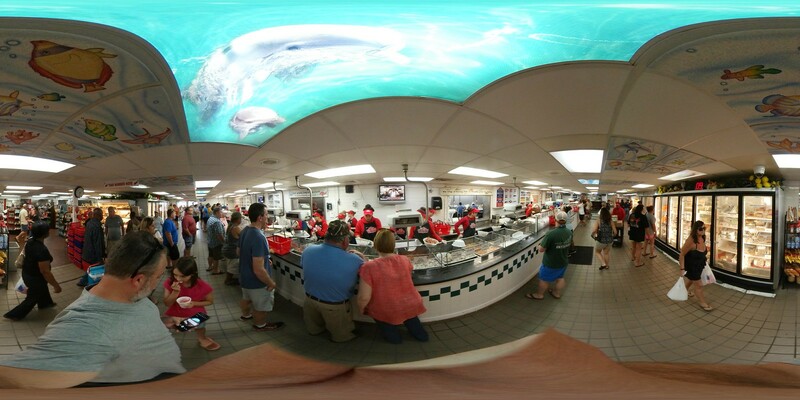 You've got a bulbous fisheye lens sticking out either side, each picking up 180 degrees of what's going on. You've got a mohawk in the center that houses a tiny half-inch display and record button. On one side you'll find buttons for operating the Gear 360, and on the other is a sealed hatch (futuristic killer space creatures have hatches, not doors) behind which is the microUSB port for power, the microSD card for storage, and the removable battery. If you want to chop the Gear 360 off at the knees (and severely limit its ability to do damage to yourself or loved ones) you can unscrew the legs to reveal the standard quarter-inch tripod mount. (The legs, by the way, are where you can attach the included wrist strap, which also serves as a fine way to chain up the Gear 360 at night, so it can't come at you during your slumber.) When folded closed there's a sort of strange contrast between the stubby, carrot-like taper of the black legs against the racquetball-sized sphere that maybe makes it even more futuristic-looking. But it also means you're sort-of holding a palm-sized plastic shank. And that's where we reach my biggest issue with the Gear 360. It's ungainly. It comes with its own drawstring bag, which is great, though it doesn't offer too much in the way of protection. And all of these cameras need some sort of protection for the large lenses. But it doesn't easily fit into a pocket, let alone slip into one. Cargo pants, sure. But not really anything without that extra pocket. Certainly not skinny hipster jeans. If you're going to lug this thing around in a purse or some other sort of bag, then fine. But this hasn't been the sort of camera I take with me just because I can, and that's severely limited its usefulness. And that's a shame. Under the hood (and under the hatch) the Gear 360 is using its own DRIMe5s chipset for image processing. It's got 1GB of RAM, zero internal storage (you'll need a microSD card for that) and the aforementioned 1350 mAh battery. So far as I can tell that's all been fine and dandy. There's no big display to push here, so the smaller battery has done just fine. The tiny display we do have is a lot more functional than you might think. With it you're able to get a quick look at which shooting mode you're in, and how much storage is left. Or great for getting a quick look at the battery level, making it much easier to see if the camera needs a charge. And you can change modes with the buttons on the camera, using the display to confirm whether you're shooting stills or video. Basically, you can shoot just about any way you want, straight from the camera, without having to fire up the phone. While that almost makes it tempting to say you could still pick up the Gear 360 even if you don't use a Samsung phone, but I'm not sure I'd be willing to go quite that far just yet. The camera's good, but I'm not sure if it's that good to justify the hassle of manually processing 360-degree photos and video just yet. Back to that display real quick. I cracked mine. I accidentally dropped my Gear 360 — in its protective bag — from my hand about 2 feet onto my garage floor as I was getting into the car. (Now had the camera been able to fit into my pocket...) The camera still works just fine. The display works, too. But the glass or plastic or whatever it is covering things there has cracked. Be careful with this camera. I've reviewed three 360-degree cameras now. I can say without any hint of reservation that Samsung's software experience is the best I've seen. From the time you download the Gear 360 Manager app (mine's initially loaded from Samsung's app store, but the binary also is in Google Play) to connecting the camera itself, to shooting and sharing photos, Samsung does it the best. Period. Full stop. The only hiccup I've seen is if the camera disconnects from the phone before it's expecting it to, and the app locks up. Closing it out from the recent apps view seems to fix things. But it's happened enough times that it's worth noting here. Now that Facebook handles 360 video and pictures, most folks' needs should be met. The Mode section is more important. This is where you'll switch from still pictures to video, or to time lapse. Standard stuff. But there's also a "Video Looping" mode that will record for a predetermined time — either 5, 30, 60 minutes, or "Max." When that time's up, it'll erase the previous file and start recording again. When you know you have what you want, you just stop recording. That'll save storage space, and should make any editing a little easier. Like other 360-camera apps, Samsung has comprehensive manual controls as well. Some are on the top level, others are buried a little further in the settings menu. You can control the max ISO, turn on some extra sharpening, set exposure and white balance and HDR. And what probably is my favorite feature — set a timer (2 seconds, 5 seconds, or 10 seconds) so that you can set the camera down and get your fat fingers out of the way, or prep the shot then not be staring into a phone for the duration. I haven't always used the app, though. That's a testament to how well Samsung thought out the Gear VR as a total product. With just a few presses of the buttons you can switch modes and save yourself a little time once you're actually shooting. For quick hits, where I didn't want to be any more conspicuous than I had to be — though it's kind of hard to not stand out when you're holding a little alien camera thing — this worked great. You've got got some options for the max resolution of the finished product. Video ranges from 1920x96 to 3840x1920. For 360-degree pictures and especially video, you always want as much resolution as possible, though that does eat into the storage. Single-lens video maxes out at 2560x1440. There's also an option to shoot 360-degree video at 60 frames per second, though the resolution drops to 2560x1280. Battery life has been OK. It's not a huge cell or anything, so you're going to have to keep it charged up. But it little display makes it so easy to see whether the camera's charged — and that's been a much nicer feature than we expected. The other side of the metaphorical (and, I guess, spherical) coin is sharing pictures. Samsung's also using a modified version of its own gallery app in that sense. That is, you've got basically the same user interface to deal with, and that means it's very intuitive. There are two sections — Mobile Device, and Gear 360. With one tap you're able to see what's been synced to your phone, and what only lives on the Gear 360. You'll tap a picture to view it. At this point any 360-degree shots will be stitched together — it takes just a couple seconds and then they're reading for viewing on the phone, or if you plug into a Gear VR headset. Sharing pictures isn't any more difficult. You hit the share button and chose where you want to send things — and that's it. Samsung worries about disconnecting from the Gear 360 just long enough to establish a proper internet connection. That is, I assume it disconnects from the Gear 360. The fact is that it works exactly as you'd expect it to from an end-user's standpoint. You don't have to think about it at all. Well, the only thing you'll have to think about is where to share your 360-degree photos and video. The good news is that Facebook now handles both with ease. And there's still Flickr and Google+ and Google Maps, of course. And along with the announcement of U.S. pricing, Samsung is opening up its "Samsung VR" platform (previously "Milk VR") to users to upload videos. It's a relatively simple thing. Upload your video — it has to be shot in the highest resolution, though, at 3840x1920 — give some descriptive information, and you're done. 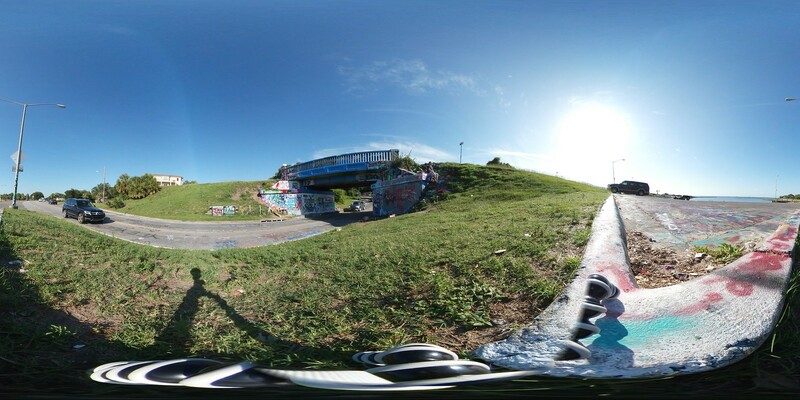 You've now got a place to share (including embed code) your 360-degree videos. It's not the most user-friendly thing we've seen (I have no idea what stereoscopic type I've been using, nor whether I've got quadrophonic or binaural audio), and for some reason Samsung has reversed the scrolling orientation when you drag with a mouse — but it works. Beyond that, there's an "Interactive Video Projects" section (that doesn't seem to be working for me yet), and you'll be able to see 360 videos from more of Samsung's partners. You can see a quick sample here. We're not embedding it here because Samsung has it set to autoplay by default, which is bad. 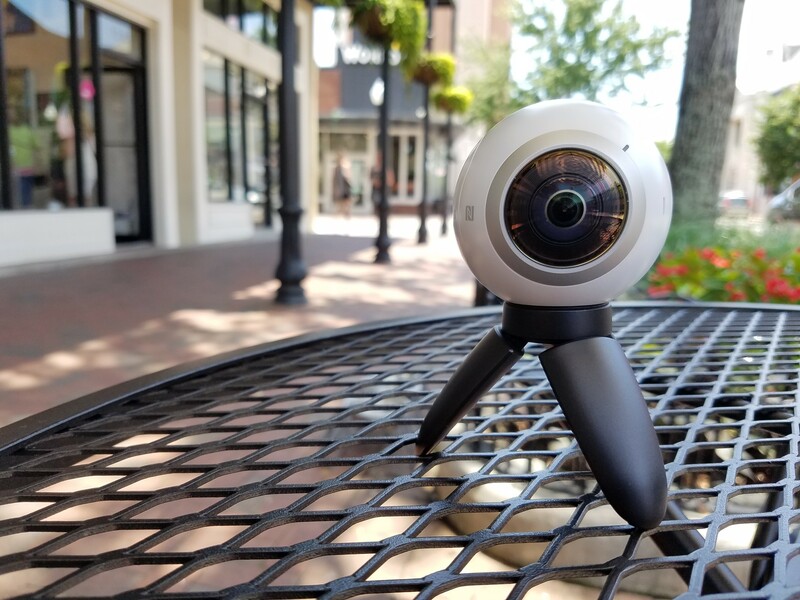 If it seems like we're gushing over the Gear 360 software experience more than a little, it's because we are. Until this camera that's been the Achilles' Heel of every other 360 device we've used. Nothing comes close. And that extends to the point of updating the firmware on the camera as well. 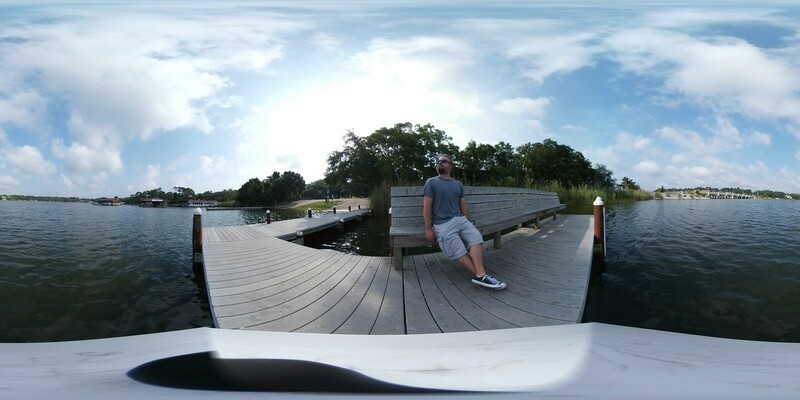 You'll do that through the Gear 360 Manager app. You don't have to download a separate program to a computer. You don't have to worry about plugging in. You will want Wifi — the one firmware update we've had so far weighed in at 320 megabytes — but that's it. After downloading the update your phone will push over the file, the Gear 360 will update itself, and you can go right back to shooting. 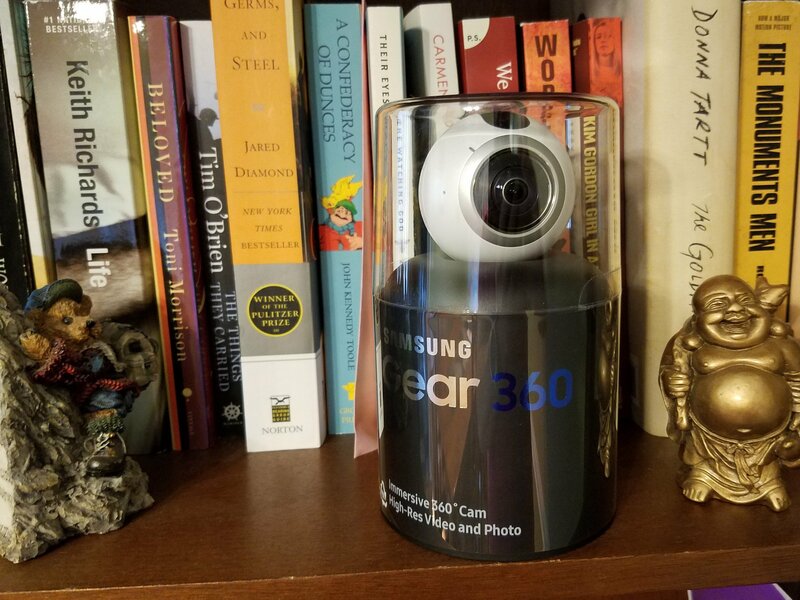 On paper, the Samsung Gear 360 is the best of the sub-$500 360-degree cameras we've used. It's got a higher resolution for photos and video — and that's especially important with the latter. The Gear 360 is a great buy if you want an easy software experience but don't mind a more awkward carry. The end result (which you can see smattered throughout this review) is pretty good. Really good, mostly. The Gear 360 has issues with stitching — that's the line where one camera's image blends into the next — which can be pretty pronounced at times. The two lenses are farther away from each other than on other cameras we've used. If you're holding the Gear 360 in your hand, your hand will absolutely get chopped off in pictures and video. And occasionally we've seen pronounced stitching lines in the background of shots. But we've also found that the stitch lines sometimes disappear when the pictures or video are shared, thanks to compression running on the various social networking services. It's more apparent closer to the camera — especially when you have a tripod that sticks out farther than the include one. In this area, the Gear 360 absolutely lags behind the likes of the LG CAM 360 and the Ricoh Theta S.
For me the bigger issue is one of portability. Not that the Gear 360 is big — it's not. It's just that this ball-shaped camera with the blunt spike sticking out the end doesn't easily fit into a pocket. Cargo pants? Yes. Anything else? Nope. At least not without getting some really weird looks. And the included bag really just makes it that much more unwieldy. If you're going to carry it around in a messenger bag or a purse or something? Have at it. But me? I like pocketability. I like being able to pick it up on my way out and maybe take some pics while I'm going about my day, or maybe not. The other is that if you don't have one of the five devices we listed at the top of this review, it's all moot anyway. And that's a shame (and we've said this so many times about Samsung products before) because the Gear 360 is a lot of fun to use. It's the best overall 360 camera experience thus far. Great pictures and video. Tremendous software experience. And just a couple big criticisms. The retail price $349 — puts the Gear 360 squarely in the same arena as the Ricoh Theta S, which remains atop our list of the best 360-degree cameras in this price range. It has better stitching and works with more phones, and is less of a pain to carry around. (And Ricoh has its own sharing ecosystem, too.) But so long as you can put up with the more awkward form factor and stitching glitches, the Samsung Gear 360 isn't a bad purchase at all.